Author: Adjaratou Oumar Sall. Series edited by: Wilhelm J.G. Möhlig. 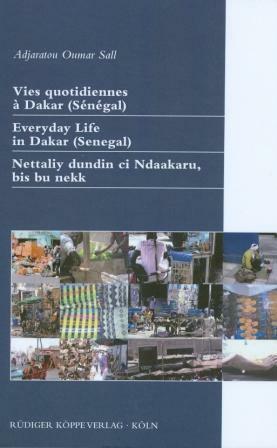 The text presented in this book consists of various oral literature reports collected in the streets of Dakar, Senegal. They have been published to give a visibility of the daily life of the Senegalese and immigrants from the neighbouring countries. Various ways of earning money are presented, from taxi driving over trading to begging in the streets. The reader is given insight into the daily demands the workers have to cope with as well as their hopes and fears. Therefore, the texts are carefully translated close to the original reports from Wolof into French and English to avoid losing the “spirit” of the original story. The expressions of the people in Dakar show the pride as well as the humiliation they feel during their work, the love for their country as well as their faith in God. The texts of this collection are throughout presented in three languages: Wolof, French and English. Wolof, a language of the northern branch of the West Atlantic language family, is mainly spoken in Senegal by approximately 4 Mill. people. The present book gives valuable insights into the culture of work in Senegal and can be seen as good basic material for further research into this topic. The careful translations by the author add a precious groundwork for studies in Senegalese oral literature. The text collection portrays the métiers of the ordinary folk and the men and women inhabiting the streets of Dakar appear vivid and powerful in the mind’s eye of the reader. Be it the shoemaker, the retailer, the market-woman or the weaver, the street barber, the taxi driver, the beggar or the maid, they all talk about the daily routine of everyday life in Dakar, the problems they encounter, the pleasures they gain and how they manage to survive. Short comments on the cultural settings of the diverse activities, these people are engaged in, and a lifelike photo each taken in the streets of the city supplement the portrayals of Dakar’s working class. Whether these interviews are read in Wolof, French or English, they are deeply moving and design a very personal image of the living conditions in Senegal’s capital. Published documentary texts in Wolof are still rare and Sall’s book is a most welcome contribution to the literature on African languages.